Seitan is gluten protein from wheat, often known as “wheat meat” or “wheat gluten”. The texture of cooked seitan is very similar to that of meat, thus making it a popular meat substitute. 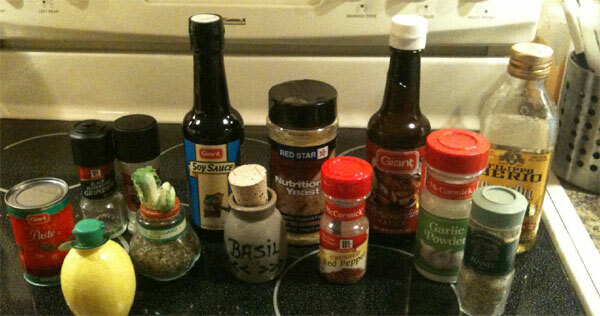 If you look in ingredient list, you will find seitan in many of your favorite mock meat dishes. 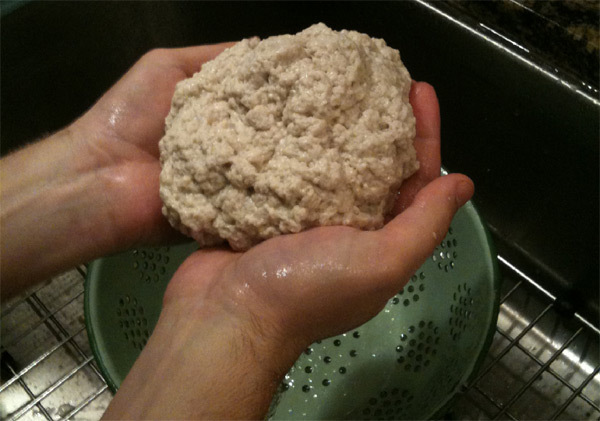 Last October Jimmy and I tried our hand at making seitan sausage from a 5lb bag of white flour. Here’s how it went! We used several sources for the recipe and the procedure. The how-to and the sausage idea came from the respective links. We began by adding water to the flour in a large bowl and working it into good dough. We continued to add water and flour until we felt that we had a good dough: not too dry, not too soggy. 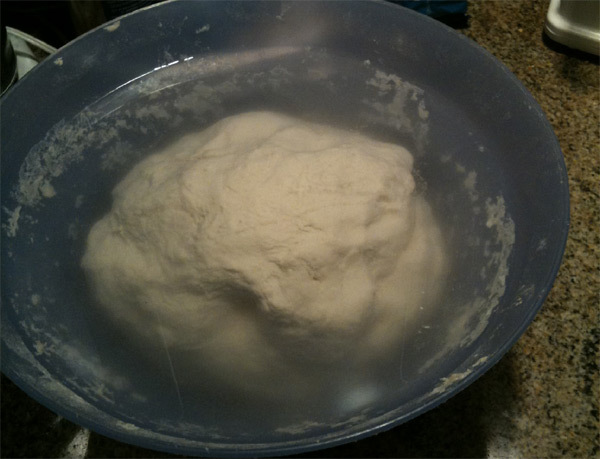 Next, it was time to fill the bowl with water and let the dough ball soak. This is to allow the starch and the gluten to separate. Success! 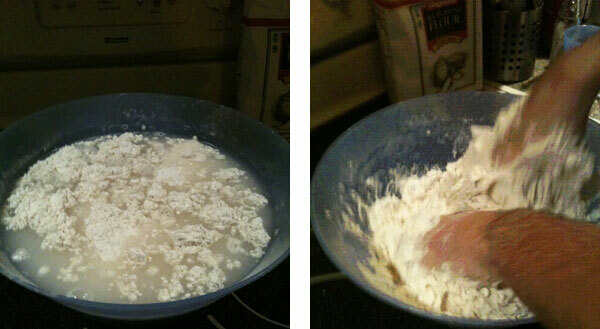 Once we started handling the dough, the starch quickly began to rinse out, leaving just gluten behind. 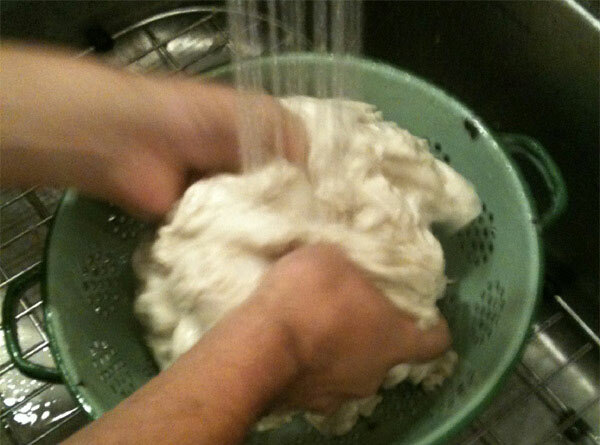 Continue to rinse the starch away under running water, until you have only gluten left. 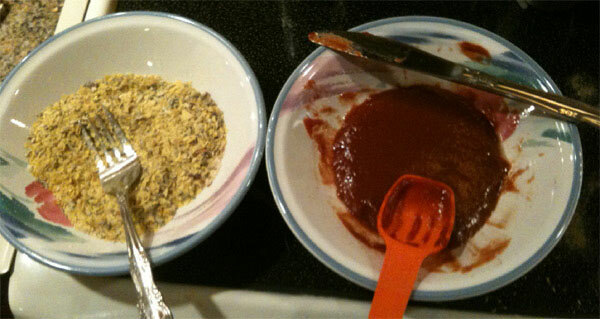 Next, we added in seasoning to give the seitan a sausage sort of flavor. The sausage ingredients list was from the link , and included; fennel seeds, basil, marjoram, red peppers, sage, garlic powder, yeast, soya sauce, olive oil, worstershire sauce etc. 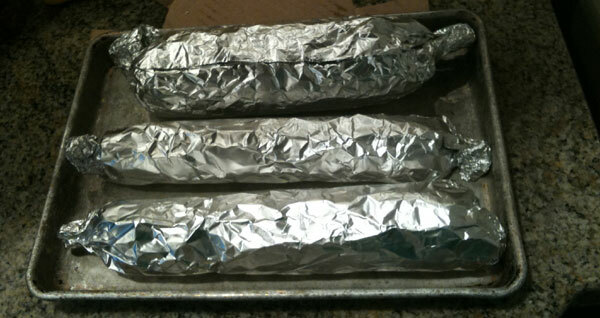 After mixing everything, we split the seitan into quarters and baked as 3 “sausages” wrapped in tin foil (2 1/4lb, and 1 1/2lb sausages). Delicious! Approximately 5lbs of flour yielded 1lb of seitan. The sausage also freezes well, so you don’t need to worry about it going bad before you can finish it all. Unfortunately, I don’t have any photos of the finished seitan sausage — they were finished before I could take any, and were a hit at several holiday parties! Don’t be fooled by the photos. This was a 4+ hour project, and left the kitchen covered in flour! 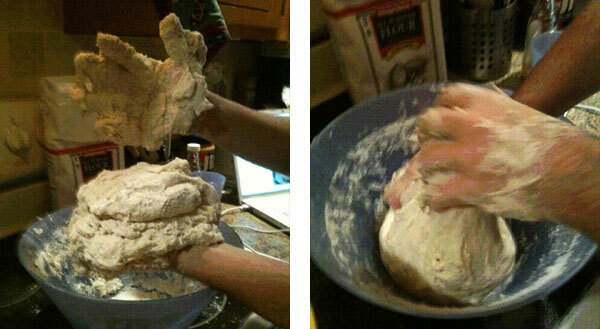 Despite the work involved, it’s a great way to learn about flour and gluten while making dinner that will last a while. One more thing! This was not quite entirely vegetarian. Standard Worcestershire sauce apparently contains a very small amount of anchovies. This looks awesome, and really easy to do! I’ll have to try it sometime. I always loved getting seitan based mock meats in vegetarian Chinese restaurants. The process you showed here for making seitan looks simpler than what I imagined. I would definitely give it a try. Thanks for sharing. This looks interesting but I think if I try it I will use gluten flour instead of going through the trouble of separating the gluten from white wheat flour! Beth, you are correct, that would save a lot of time and work. This project was an experiment, and it was a lot of fun to make a mess! In the future though, I’d probably use the gluten flour as well. Just so you know, Worcestershire Sauce is traditionally based on Anchovy, so is NOT vegetarian. Lea and Perrins Worcestershire Sauce is a fish sauce! Jeremy, thanks for the comment! You’re correct, and I did mention that in the last line of the post. Several vegetarian friends have told me they’re usually willing to turn a blind eye to this sort of exception, since it’s such a small amount of fish. Still a good thing to keep an eye out for… I had no idea Worcestershire sauce included anchovies until I embarked on this project!